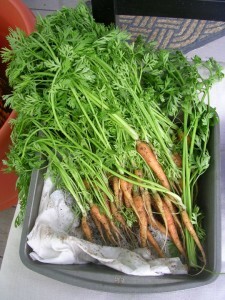 The leafy tops attached to fresh carrots in the form of umbrella-like clusters are referred to as carrot greens. 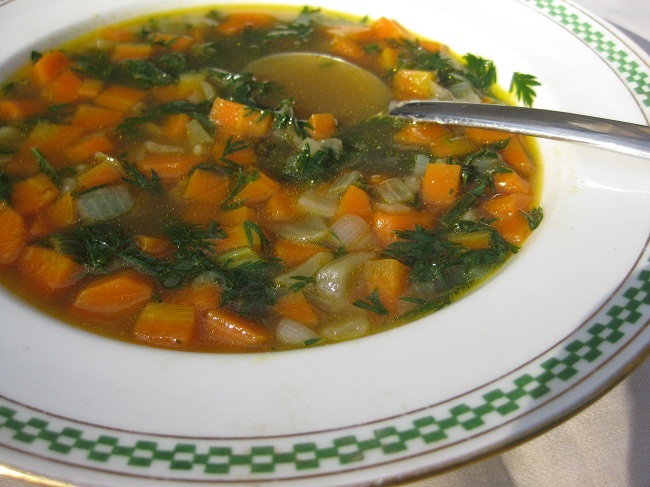 Though there are a lot of speculations regarding the edibility of carrot tops, these leafy greens are high in proteins, vitamins and minerals, which make it a useful ingredient in soups, salads, and curries. 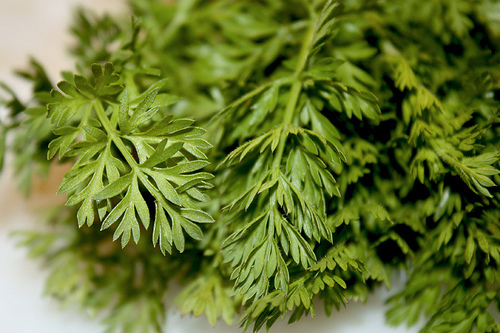 They are lacy and feathery in appearance, somewhat resembling coriander leaves, also being coarse and grainy in its raw form. Their slightly bitter, astringent and grassy flavor blends perfectly with a tinge of sweetness. Given below is the nutritional data of one cup raw carrot greens. Because of its high vitamin C content that is six times more than that of the roots, adding carrot greens as a part of your diet along with other healthy foods can help in protecting the immune system. It may even help your body to fight against cough and cold, also ensuring healthy, glowing skin. Chlorophyll contains powerful phytonutrients which work towards preventing the growth and formation of tumors. Studies show carrot leaves to have the ability to inhibit the growth of tumorous cells, in turn restricting malignant cell division. Effects on the kidney: Acting as a mild diuretic, chlorophyll helps in stimulating the flow of urine while its detoxifying properties aid in filtering the kidney thus minimizing the risk of edema as well as combatting kidney stones or dissolving the ones already formed. Effects on the colon: The detoxification effects of chlorophyll also help in loosening and cleansing the colon while the dietary fibers assist in pushing out the accumulated wastes, promoting better absorption of nutrients. Including carrot greens as a part of your diet may ensure a good heart health as its high potassium content and antioxidant properties work towards regulating blood pressure as well as protecting the heart from getting damaged by free radicals. The high content of magnesium in chlorophyll helps in toning, contracting, and relaxing the muscles, whereas Vitamin K helps in increasing bone density. Carrot greens contain a combination of both, thus having it in substantial amounts may lead to a sound bone health, lessening the chances of bone related problems like osteoporosis. 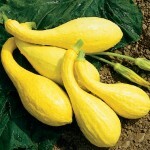 In spite of their bitter taste, their crunchy texture makes them be used raw in salads. The leafy greens can be used in preparing juices along with the carrots. Its astringent flavor makes it perfectly blend with sweet fruits like apples and bananas for making smoothies. 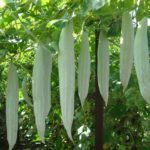 They can be used as an ingredient in soups, broths or stock prepared from chicken, beef or vegetables after being blanched or sautéed. It may be included in curries along with other greens or be a part of stir fries too. Carrot tops can be used in making tea as they help in the proper functioning of the kidney and bladder along with other health benefits. 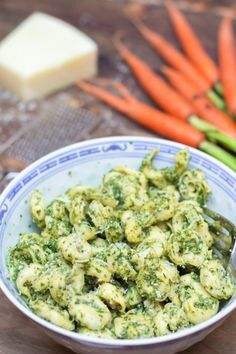 It can be used as an alternative for basil while preparing pesto. 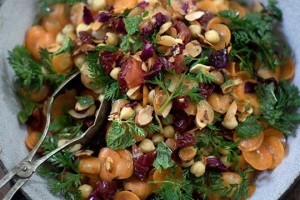 Because of its pleasing appearance, it can be used for garnishing several dishes in place of parsley or cilantro. Because of the antiseptic properties, carrot leaf juice is used as mouthwash for minimizing bad breath as well as healing mouth sores. The greens can be mashed and mixed with honey to help in cleaning festering wounds. Wash the greens well in cold running water and chop them into pieces. Fill a medium sized sauté pan with water and set the heat to a moderate level. Add the greens to the pan. Allow them to blanch and steam till they turn bright green and reduce in volume. Drain the excess water with a strainer. Add about two tablespoons of olive oil along with a dash of salt and pepper to the saute pan. Allow the greens to saute in the oil for about a minute. You can add lemon juice if desired for taste. Cook for about thirty seconds more and serve hot. The carrot tops can be stored for a couple of days in the refrigerator after being blanched, washed in cold water and wrapped in plastic bags or a damp paper. It is recommended to eat them fresh or in a few days after buying, as these fragile greens may get wilted when kept for long. People would mostly use these greens as a replacement for certain vegetables rather than the other way round. However, substitutes for the greens include parsley, celery, and dill as they belong to the same botanical family. Though people have raised many questions about its poisonous nature, carrot greens are not toxic at all, and can be safely eaten after being washed properly to remove the dirt or pesticides spread on them. 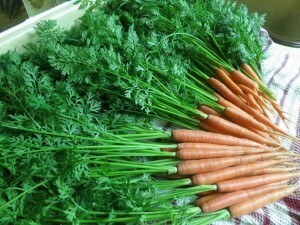 Carrot greens have no known side effects as such unless consumed in increased amounts. 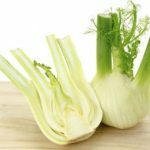 Moreover, if you are allergic to celery or parsley which are members of the same family as the greens, then refrain from having it. 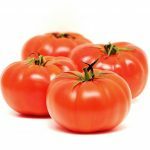 Though being rich in Vitamin A, folate, iron, manganese, thiamine, zinc as well as other essential minerals that are beneficial during pregnancy, these leafy tops are said to contain porphyrins in a signification amount which may result in uterine contractions. Thus, it is better for pregnant women not to incorporate it in their diet. 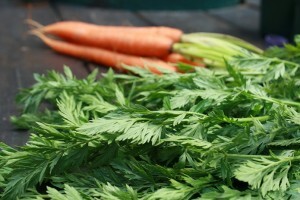 You may not find them quite often in the grocery or supermarket as these leafy tops are removed to improve the shelf life of carrots because they continue drawing out the moisture from the roots drying the vegetable quickly. 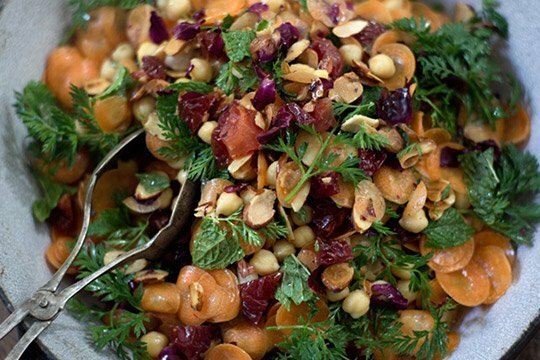 While purchasing carrot greens, go for the bright-colored ones with a feathery appearance to get the fresh flavor. 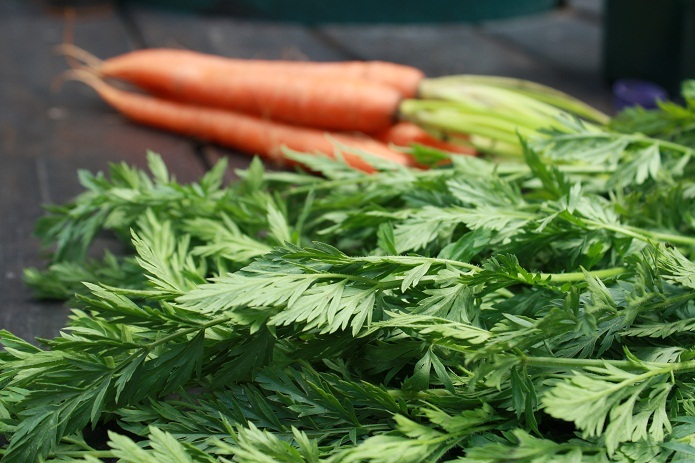 The leaves of carrots were often worn by Englishwomen in the 1600s in place of feathers or flowers. According to the Greek physician Pedanius Dioscorides, carrot leaves were used by the Greeks for combating cancerous tumors.